One of our customers asked this week if it would be possible to adjust how Treatments are described on Invoices and Receipts. As sometimes you would give your treatments a name that is appropriate for Online Booking, but that name may not make sense in the context of a Receipt to submit to an Insurer. We’ve added a field to the Treatments, where you can provide an alternate name that will be printed on the invoices and treatments. 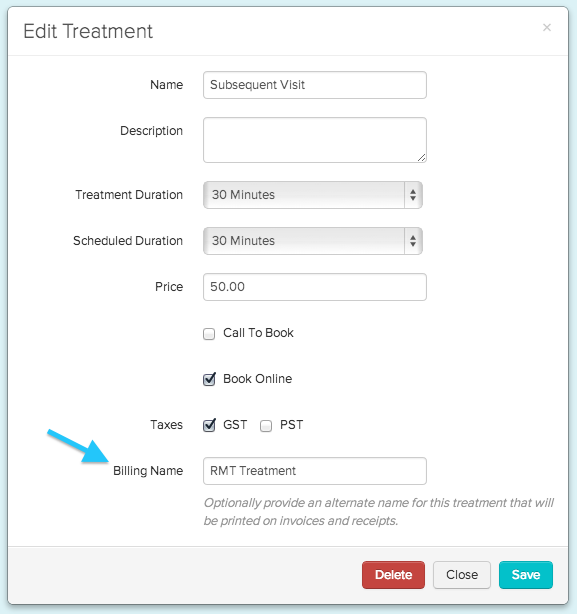 Fill in the “Billing Name” field if you want to customize the treatment’s name, or leave it blank to use the treatment’s name. Hope this helps! As always, let us know how Jane is working for you and if there’s anything we can do to improve your experience.